Continuing with the current Hollywood trend, Michael bay will shoot scenes for Transformers 2: Rise of the Fallen with IMAX cameras. Variety reports that Bay will follow the same trend Nolan did with The Dark Knight and as Favreau has recently talked about with Iron Man 2, by shooting 3 scenes for IMAX. What does this mean? It means, Transformers 2 will be on IMAX dummy! IMAX and Transformers seems like a match made in heaven, especially with Bay's typical camera work. Let's be honest, the 70mm images are no comparison to the traditional 35mm film, so why wouldn't any big action film want to utilize the format. The only drawback, is the ticket price when the film hits IMAX theaters. I have too many friends that forgo the experience because of the inflated ticket price. Myself, I havent missed one feature that has been presented in IMAX format to date (Scratch that, I have yet to watch Eagle Eye on IMAX, but plan to do so). For those of you that have yet to catch on to the IMAX craze, here's an example of what you get when you pay the extra $5! The difference is absolute and once you've seen a film shot for IMAX, you wont ever want to go back to the normal shoebox's that can be called movie theaters. 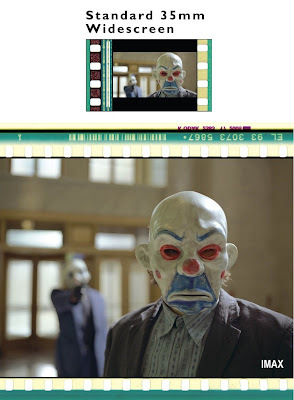 Anyways checkout the film cell comparison below. The top is traditional 35mm while the bottom one is IMAX 70mm. 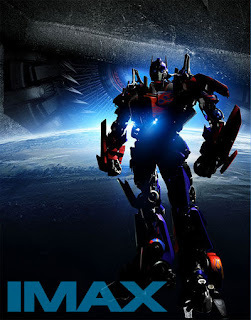 Excited for Transformers 2:Rise of the Fallen on IMAX? I can't wait! As much as I think Bay is a joke in the directing world, I do love Bad Boys and Transformers!